Irony (from Ancient Greek εἰρωνεία (eirōneía), meaning "dissimulation, feigned ignorance"), in its broadest sense, is a rhetorical device, literary technique, or event characterized by an incongruity, or contrast, between what the expectations of a situation are and what is really the case, with a third element, that defines that what is really the case is ironic because of the situation that led to it. Irony may be divided into categories such as: verbal, dramatic, and situational. Verbal, dramatic, and situational irony are often used for emphasis in the assertion of a truth. The ironic form of simile, used in sarcasm, and some forms of litotes can emphasize one's meaning by the deliberate use of language which states the opposite of the truth, denies the contrary of the truth, or drastically and obviously understates a factual connection. Other forms, as identified by historian Connop Thirlwall, include dialectic and practical irony. Henry Watson Fowler, in The King's English, says "any definition of irony—though hundreds might be given, and very few of them would be accepted—must include this, that the surface meaning and the underlying meaning of what is said are not the same." Also, Eric Partridge, in Usage and Abusage, writes that "Irony consists in stating the contrary of what is meant." The American Heritage Dictionary '​s secondary meaning for irony: "incongruity between what might be expected and what actually occurs". This sense, however, is not synonymous with "incongruous" but merely a definition of dramatic or situational irony. It is often included in definitions of irony not only that incongruity is present but also that the incongruity must reveal some aspect of human vanity or folly. Thus the majority of American Heritage Dictionary's usage panel found it unacceptable to use the word ironic to describe mere unfortunate coincidences or surprising disappointments that "suggest no particular lessons about human vanity or folly." 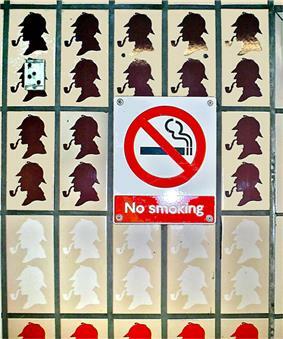 A "No smoking" sign surrounded by images of a smoking Sherlock Holmes at Baker Street tube station. Romantic irony: The Encyclopedia states that "The most significant change in meaning took place in 1797, when Schlegel observed in his Fragments: 'there are ancient and modern poems which breathe throughout, in their entirety and in every detail, the divine breath of [irony].'" It is seen as "a consistent alternation of affirmation and negation, of exuberant emergence from oneself and self-critical retreat into oneself, of enthusiasm and skepticism." Tragic irony: The Encyclopedia says this term: "was introduced by Connop Thirlwall in 1833, who based it on a distinction among three basic types of [irony]: verbal, dialectic, and practical." Cosmic irony: "[Irony] took on a new and more comprehensive dimension with Hegel, who strongly opposed romantic [irony] because of its "annihilating" tendency, seeing in it nothing but poetic caprice." In The History of Philosophy, Hegel sensed in the "crowding of world historical affairs," in the trampling down of the "happiness of peoples, wisdom of states, and virtue of individuals," in short, in his comprehensive view of history, an ironic contrast between the absolute and the relative, the general and the individual, which he expressed by the phrase, "general [irony] of the world." one meaning is stated and a different, usually antithetical, meaning is intended. The [irony] of a statement often depends on context. If one looks out of his window at a rain storm and remarks to a friend, "Wonderful day, isn't it?" the contradiction between the facts and the implied description of them establishes the [irony]. a plot device according to which (a) the spectators know more than the protago­nist; (b) the character reacts in a way contrary to that which is appropriate or wise; (c) characters or situations are compared or contrasted for ironic effects, such as parody; or (d) there is a marked contrast between what the character understands about his acts and what the play demonstrates about them. A disparity of awareness between actor and observer: when words and actions possess significance that the listener or audience understands, but the speaker or character does not; for example when a character says to another "I'll see you tomorrow!" when the audience (but not the character) knows that the character will die before morning. It is most often used when the author causes a character to speak or act erroneously, out of ignorance of some portion of the truth of which the audience is aware. In tragic irony, the audience knows the character is making a mistake, even as the character is making it. Poetic irony. The Encyclopedia says that: "during the modern period [especially], beginning with romanticism, [irony] has become inseparable from literary and poetic expression itself." Verbal irony is a statement in which the meaning that a speaker employs is sharply different from the meaning that is ostensibly expressed. The ironic statement usually involves the explicit expression of one attitude or evaluation, but with indications in the overall speech-situation that the speaker intends a very different, and often opposite, attitude or evaluation. In City Lights the audience knows that Charlie Chaplin's character is not a millionaire, but the blind flower girl (Virginia Cherrill) believes him to be rich. In Oedipus the King, the audience knows that Oedipus himself is the murderer that he is seeking; Oedipus, Creon and Jocasta do not. In Othello, the audience knows that Desdemona has been faithful to Othello, but Othello does not. The audience also knows that Iago is scheming to bring about Othello's downfall, a fact hidden from Othello, Desdemona, Cassio and Roderigo. In The Cask of Amontillado, the reader knows that Montresor is planning on murdering Fortunato, while Fortunato believes they are friends. In The Truman Show, the viewer is aware that Truman is on a television show, but Truman himself only gradually learns this. In Romeo and Juliet, the audience knows that Juliet is already married to Romeo, but her family does not. Also, in the crypt, most of the other characters in the cast think Juliet is dead, but the audience knows she only took a sleeping potion. Romeo is also under the same misapprehension when he kills himself. Tragic irony is exemplified in ancient drama ... The audience watched a drama unfold, already knowing its destined outcome. ... In Sophocles' Oedipus the King, for example, 'we' (the audience) can see what Oedipus is blind to. The man he murders is his father, but he does not know it. Further, Oedipus vows to find the murderer and curses him for the plague that he has caused, not knowing that the murderer he has cursed and vowed to find is himself. Irony has some of its foundation in the onlooker's perception of paradox that arises from insoluble problems. For example, in the William Shakespeare play Romeo and Juliet, when Romeo finds Juliet in a drugged deathlike sleep, he assumes her to be dead and kills himself. Upon awakening to find her dead lover beside her, Juliet stabs herself with a dagger thus killing herself. This is a relatively modern use of the term, and describes a sharp discrepancy between the expected result and actual results in a certain situation. The Wonderful Wizard of Oz is a story whose plot revolves around situational irony. Dorothy travels to a wizard and fulfills his challenging demands to go home, before discovering she had the ability to go back home all the time. The Scarecrow longs for intelligence, only to discover he is already a genius, and the Tin Woodsman longs to be capable of love, only to discover he already has a heart. The Lion, who at first appears to be a whimpering coward, turns out to be bold and fearless. The people in Emerald City believed the Wizard to be a powerful deity, only to discover that he is a bumbling, eccentric old man with no special powers at all. In the ancient Indian story of Krishna, King Kamsa is told in a prophecy that a child of his sister Devaki would kill him. To prevent this, he imprisons both Devaki and her husband Vasudeva, allowing them to live only if they hand over their children as soon as they are born. He murders nearly all of them, one by one, but the seventh and eighth children, Balarama and Krishna, are saved and raised by a royal couple, Nanda and Yashoda. After the boys grow up, Krishna eventually kills Kamsa as the prophecy foretold. Kamsa's attempt to prevent the prophecy led to it becoming a reality. This story is similar to those in Greek mythology. Cronus prevents his wife from raising any children, but the one who ends up defeating him is Zeus, the later King of the Gods. Other similar tales in Greek Mythology include Perseus (who killed his grandfather, Acrisius by accident with a discus despite Acrisius' attempt to avert his fate), and, more famously, Oedipus who killed his father and married his mother not knowing their relationship, due to being left to die by his father to prevent that very prophecy from occurring. According to Sudhir Dixit, "Cosmic irony is a term that is usually associated with [Thomas] Hardy. ... There is a strong feeling of a hostile deus ex machina in Hardy's novels." In Tess of the d'Urbervilles "there are several instances of this type of irony." In a more tragic example of historical irony, what people now refer to as "The First World War" was called by H.G. Wells "The war that will end war", which soon became "The war to end war" and "The War to End All Wars", and this became a widespread truism, almost a cliché. Historical irony is therefore a subset of cosmic irony, but one in which the element of time is bound to play a role. Another example could be that of the Vietnam War, where in the 1960s the U.S. attempted to stop the Viet Cong (Viet Minh) taking over South Vietnam. However, it is an often ignored fact that, in 1941, the U.S. originally supported the Viet Minh in its fight against Japanese occupation. Historical irony also includes inventors killed by their own creations, such as William Bullock—unless, due to the nature of the invention, the risk of death was always known and accepted, as in the case of Otto Lilienthal, who was killed by flying a glider of his own devising. In 1974, the U.S. Consumer Product Safety Commission had to recall 80,000 of its own lapel buttons promoting "toy safety", because the buttons had sharp edges, used lead paint, and had small clips that could be broken off and subsequently swallowed. Introducing cane toads to Australia to control the cane beetle not only failed to control the pest, but introduced, in the toads themselves, a very much worse pest. This irony is exemplified by the song There Was an Old Lady Who Swallowed a Fly, in which the lady swallows a fly, and then swallows a spider to catch the fly, and so on with larger and larger animals, until she dies. Kudzu—a vine imported to the United States in the 1930s and planted all over the South at the direction of the U.S. Government to prevent soil erosion. Instead of preventing erosion, it climbs and chokes native trees and plants, thus causing even more erosion. Also, "Long ago, the city [of Birmingham, Alabama] outlawed the livestock that would happily be eating the nutritious green kudzu leaves." Referring to earlier self-conscious works such as Don Quixote and Tristram Shandy, Douglas Muecke points particularly to Peter Weiss's 1964 play, "Marat/Sade". This work is a play within a play set in a lunatic asylum, in which it is difficult to tell whether the players are speaking only to other players or also directly to the audience. When The Herald says, "The regrettable incident you've just seen was unavoidable indeed foreseen by our playwright", there is confusion as to who is being addressed, the "audience" on the stage or the audience in the theatre. Also, since the play within the play is performed by the inmates of a lunatic asylum, the theatre audience cannot tell whether the paranoia displayed before them is that of the players, or the people they are portraying. Muecke notes that, "in America, Romantic irony has had a bad press", while "in England ... [it] is almost unknown." Of course, romantic irony itself has more than one mode. The style of romantic irony varies from writer to writer. ... But however distinctive the voice, a writer is a romantic ironist if and when his or her work commits itself enthusiastically both in content and form to a hovering or unresolved debate between a world of merely man-made being and a world of ontological becoming. Similarly, metafiction is "Fiction in which the author self-consciously alludes to the artificiality or literariness of a work by parodying or departing from novelistic conventions (esp. naturalism) and narrative techniques." It is a type of fiction that self-consciously addresses the devices of fiction, thereby exposing the fictional illusion. This is "The dissimulation of ignorance practised by Socrates as a means of confuting an adversary". Socrates would pretend to be ignorant of the topic under discussion, to draw out the inherent nonsense in the arguments of his interlocutors. The Chambers Dictionary defines it as "a means by which a questioner pretends to know less than a respondent, when actually he knows more". A more modern example of Socratic irony can be seen on the American crime fiction television film series, Columbo. The character Lt. Columbo is seemingly naïve and incompetent. His untidy appearance adds to this fumbling illusion. As a result, he is underestimated by the suspects in murder cases he is investigating. With their guard down and their false sense of confidence, Lt. Columbo is able to solve the cases leaving the murderers feeling duped and outwitted. The '90s saw an expansion of the definition of irony from "saying what one doesn't mean" into a "general stance of detachment from life in general" This detachment served as a shield against the awkwardness of everyday life. Humor from that era (most notably Seinfeld) relies on the audience watching the show with some detachment from the show's typical signature awkward situations. The generation of people in the United States who grew up in the 90s (Millennials) are seen as having this same sort of detachment from serious or awkward situations in life as well. Hipsters are thought of as using irony as a shield against those same serious or genuine confrontations. The words irony and ironic are often misused. No agreed method for indicating irony exists, though many ideas have been suggested. For instance, an irony punctuation mark was proposed in the 1580s, when Henry Denham introduced a rhetorical question mark or percontation point which resembles a reversed question mark. This mark was also advocated by the French poet Marcel Bernhardt at the end of the 19th century to indicate irony or sarcasm. French writer Hervé Bazin suggested another pointe d'ironie: the Greek letter psi Ψ with a dot below it, while Tom Driberg recommended that ironic statements should be printed in italics that lean the other way to conventional italics..
^ a b c d e f Preminger, A. & Brogan, T. V. F. Brogan, The New Princeton Encyclopedia of Poetry and Poetics, MJF Books, 1993, ISBN 9780691032719, pp. 633–635. ^ irony" at dictionary.com""". Dictionary.reference.com. Retrieved 2010-12-23. ^ Quoted in The Free Dictionary under ironic: http://www.thefreedictionary.com/ironic. ^ Stanton, R., Dramatic Irony in Hawthorne's Romances, Modern Language Notes, Vol. 71, No. 6 (Jun., 1956), pp. 420–426, The Johns Hopkins University Press. ^ The Trial of John W. Hinckley, Jr. by Doug Linder. 2001 Retrieved 9 September 2008. ^ Hesiod, Theogony Works and Days Testimonia, Harvard University Press, 2006, p. xxxii. ^ Hardy, T., Tess of the d'Urbervilles, Oxford World's Classics, p. 420. ^ Wells, H.G., The war that will end war, 1914. ^ Wall Street Journal, December 3, 2007, Page B1: It Dawned on Adults After WWII: 'You'll Shoot Your Eye Out!'. Retrieved October 29, 2009. ^ Jones, W. E. & Vice, S., Ethics at the Cinema, Oxford University Press, 2010, p. 295. ^ Gordon, R., in The Shakespearean International Yearbook: Special Section, South African Shakespeare in the Twentieth Century, Volume 9, Ashgate Publishing, Ltd., 2009. p. 147. ^ OED, entry under Romantic irony. ^ OED, entry for metafiction. ^ Oxford English Dictionary under irony. ^ "Online: The Final Irony". London: Guardian. 28 June 2003. Retrieved 2010-12-23. ^ Wallace, David Foster. "E Unibus Pluram: Television and U.S. Fiction". Review of Contemporary Fiction 13 (2): 151–194.